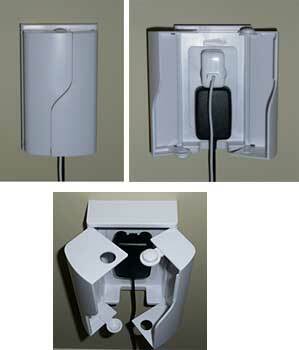 A very popular and inexpensive way to protect toddlers from electrical hazards from outlet is to use outlet plug covers. However, Colorado Childproofers has chosen not to use these are they are usually very difficult for adults to remove, they are prone to not be reinstalled after the cord has been disconnected, and foremost, they can be a choking hazard. Even though they meet the US Consumer Product Safety Commission guidelines for size requirements for children 3 years old and under, they have been known to be a choking hazard. As such we do not install these goods. The below sliding safety cover plate is the one we recommend for electrical cords and outlets that do not need to continuously plugged in. For cords that need to be plugged in all of the time, use the various outlet covers or power strip. Also we use electroluminescent night lights that use <10% of the power of a standard night light and are safer, and last for 20 years.